← If it’s August 18th, it’s time for Autoptic! Laying Out a Drop Panel. As mentioned in a previous post, comic strips are formatted different ways for different size requirements. The “drop panel” is a panel or tier of the strip that can be omitted because of size restrictions without affecting the gag or storyline. 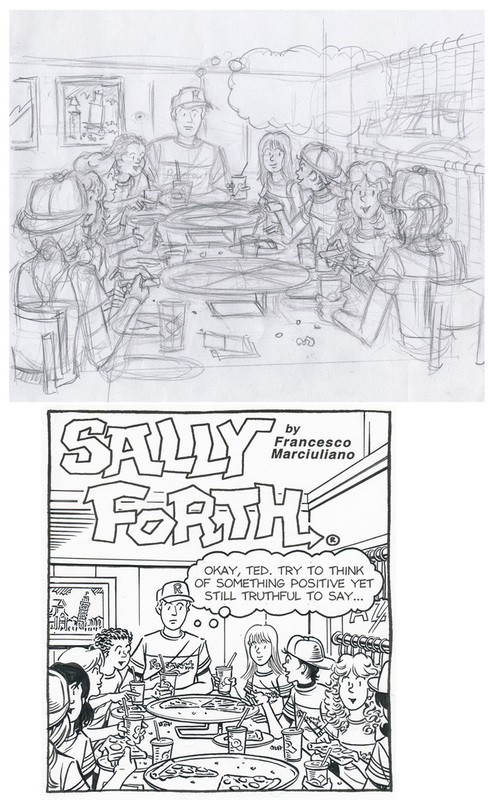 Below is the pencil roughs and finished inks for the drop panel for the Sally Forth for August 18, 2013, followed by an excerpt of the stage direction from Francesco Marciuliano’s script. Before I go to pencils on bristol, it’s invaluable that I do a tight layout first so that I can get the composition squared away. In the case of the rough shown above, I purposely cropped the rough so that Ted was still the focus and wasn’t lost in the foreground detail. I also try not to necessarily finish the drawing in the roughs. That refinement is best left for the pencils you intend to ink as more often than not transferring a drawing to bristol (using a light box) generally weakens a drawing. Working out the layout before hitting your bristol will generally give you cleaner pencils, by which I mean a page that hasn’t been erased so much (by figuring out the layout) that the eraser has roughened the bristol to the quality of toilet paper. And last but not least, here’s the rest of the Sunday page courtesy of Daily Ink.